Tonight im gonna be seeing how fast i can develop a game. The deer hunting simulator from 1066 with deer and arrows. Developed in about 7 hours of work (this also means the source is very very messy haha). Added invulnerability period while screen shake is active. Although this version represents no additions to Deerhunter it includes updates to all of the programs bundled with it and replaces all of the current versions due to bugfixes. Fifth update adds pickups and sounds. Sixth update adds highscores, bearington bear and tons of minor tweaks like setting colours of player and deer to a standard now. Seventh update fixes, new bow the bi-caster and more fixes. Ninth update adds nightmode specific vision unlocks and a helpful addon to the bomb pickup a flare! Tenth update adds the new OW_Hub launcher infront of the game giving me better control, also showing off my shiny new launcher for new prototype projects :). Finally also lengthens the height to a full resolution of 640x480 fixing any fullscreen issues anyone might have had. Twelfth update changes some of the programs bundled with it and bugfixes aspects of the launcher, may require a save reset if it errors. Last edited by StoneCrow on Tue Jun 25, 2013 5:37 pm, edited 30 times in total. Naa! Go work on AudioTree! Roland_Yonaba wrote: Naa! Go work on AudioTree! Naa! Because we are tired of screenshots and promises from you! Where is Audio Tree? Where's Cartographer? Where's is your racing game? Where's _ _ _ _? just posting them up here so people know we arent just a pair of lurkers. Should we care them? Will you do it again (not finish another project)? 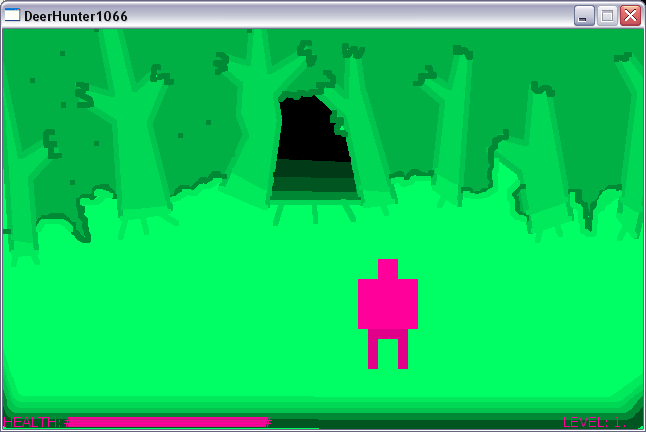 Solid pink == blindingly bright. Maybe a nice gentle ocean blue? dreadkillz wrote: Solid pink == blindingly bright. Maybe a nice gentle ocean blue? It looks like an arty LSD Love game! Put a little work in today between working on more backend stuff to make Atree a little faster at rendering noises. 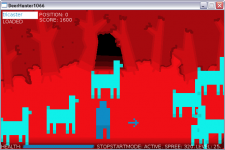 Now deer work and run around the screen happily (can't kill the smug pink guys yet), btw since it seems important the colours change slightly between levels im trying to stick to the most clashing and simple design possible though and the characters are literally the background colour inverted. Still no highscores or health pickups but its pretty much done, might do a dig-dug mode before I finish working on it. Cute. I liked playing it. Why not making different colors : one for the hunter and one for deers ? Holy Deer! It was actually released! Ok, the basic idea is nice but the directional firing ends to be a major flaw. It's possible spam fire to all directions and stay in a corner destroying waves of Bambis. I also got a blue screen when in a very advanced level with lots of bambis onscreen. (187, main.lua. collisionDetect, 290, main.lua, update). EDITED: Got another much sooner. Spamming fire punishment? Maybe a wave indicator could be handy. EDITED: Didn't noticed that before! I'm with Roland. Different color for player, bambis (and arrows). Last edited by coffee on Fri Jun 01, 2012 5:28 pm, edited 3 times in total.